I decided to pick a dragon this time. I tend to stay away from them because they're fantasy staples, like elves. But, there are different types of dragons and I don't know a thing about any of them. I picked Ryujin because it sounds badass. Sounds like something from an anime. 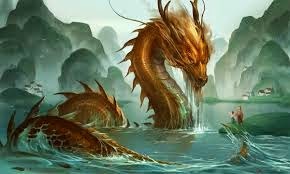 Ryujin was a Japanese water dragon that lived in a palace at the bottom of the sea. 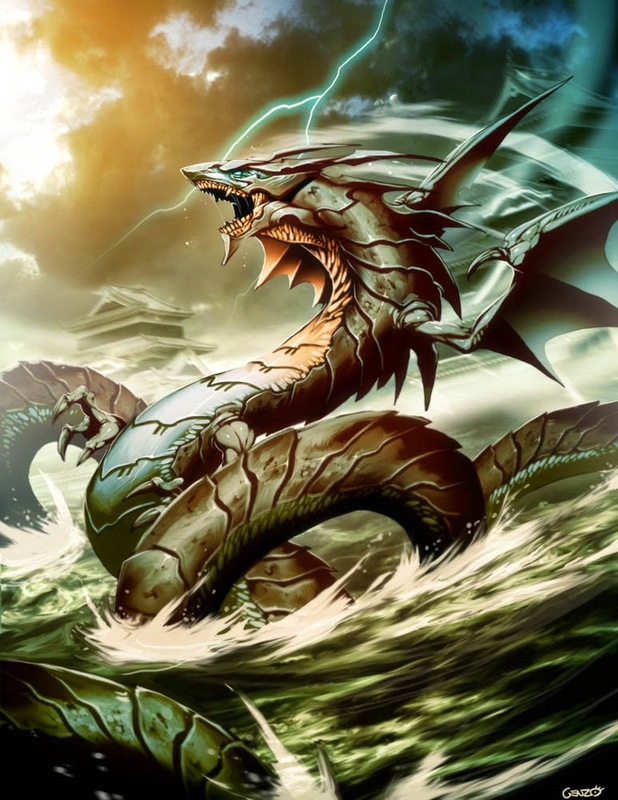 Also known as Ōwatatsumi, Ryujin was the deity of the sea who symbolized the power of the ocean. A powerful dragon, known for his nobility and wisdom. He had a large mouth and had the ability to take human form when it pleased him. He controlled when the rain would fall and turned the tides by breathing water in and out. He was revered by fishermen, sailors and all others who depended on good fortune from the ocean. Ryujin made his home in Ryugu, a magical palace of crystal and coral, far below the ocean surface. Ryujin relied on turtles, fish and jellyfish to act as his messengers. He was the father of the beautiful goddess Otohime who married the hunter prince Hoori. The first Emperor of Japan, Emperor Jimmu, is said to have been a grandson of Otohime and Hoori. Thus, Ryūjin is said to be one of the ancestors of the Japanese imperial dynasty. This water dragon makes frequent appearances in mythology (as do his many beautiful daughters). In one story, Ryujin steals priceless jewels, the tide jewels, from a prince. This prince embarks on a journey to recover the jewels when he meets a beautiful pearl diver on the beach. They marry and have a son. The pearl diver becomes a princess (Princess Tamatori). Princess Tamatori finds a way to take the jewels back from the dragon king. She plays music to lull him to sleep. When the dragon king discovers the jewels gone, he pursues her. She cuts her breast to hide the jewels inside. The blood from this action clouds the waters enough to aid her escape. She dies, but successfully recovers the jewels for her new family.